When starting on this letter, I considered talking about Hurricane Florence or the 10-year anniversary of Lehman Brothers’ demise. In the end, I decided to talk about something happier: food and wine. But before I get to that, I’d like to share some exciting news. We recently received a large new mandate from long-time investor and client partner Progress Investment Management Company on behalf of one of their institutional clients – this new mandate increased assets from Progress by roughly 30%. Separately, we were awarded a substantial new sub-advisory assignment from SEI Investments and are pleased to have SEI as a new client partner of the firm. 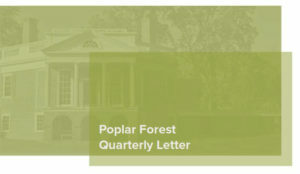 We are particularly gratified and thankful that these sophisticated investors, who have a wide array of investment choices, picked Poplar Forest. Our belief is that value investing is due for a renaissance and that the strategies we employ at Poplar Forest will potentially produce benchmark beating results when value investing comes back into vogue. For me, value investing is a bit like grocery shopping. I’m a lover of food and wine, especially when they come together in places like the wine country in Northern California. A recent weekend in Santa Rosa included a visit to Oliver’s Market – an employee-owned, independent chain with just four stores in Sonoma County. From fresh local produce to meat and seafood, gourmet cheese and prepared entrees, Oliver’s offerings are all outstanding. My wife laughs when I say that it’s my favorite store in the world, but it is! When shopping at Oliver’s, my first stop is the meat counter. On our last visit, Prime NY strip steaks were on sale for $10 a pound and fresh Coho salmon was $9 a pound. We built meals around these deals. The steaks, grilled over mesquite, were as good as anything at my favorite steakhouse, but at a fraction of the cost. The salmon was paired with sweet corn on the cob (also on sale). Just thinking about that meal makes my mouth water. At Poplar Forest, we approach investing the way I shop at Oliver’s – by focusing on what’s on sale. We don’t buy every special (some things are on sale for worrisome reasons), but when we see a good deal on a great stock, we jump on it. I think this bottom up approach is better than preparing a list at home (equivalent to a top-down forecast), then simply buying everything on that list. And can you imagine the index fund approach to grocery shopping – simply buying a little of everything in the store? What a nightmare. I’d much prefer to pay $10 a pound for four Prime NY strips than to shell out full price for single servings of the most popular cuts of beef, pork, chicken and fish. Same with stocks. Perhaps the biggest difference between hunting for investment bargains and shopping for groceries is the necessity of action. As consumers, not going to the grocery store means we have nothing to eat. I get grumpy when I’m hungry. As investors, we won’t starve if the hunt for attractive new investments yields nothing – we can simply either hold what we currently own or build up a cash position while waiting patiently for deals like those strip steaks. Early in 2018, our perusal of the stock market grocery aisles turned up opportunities in several companies with relatively defensive business models – i.e., companies that should do relatively well if the economy were to fall into recession. These bargains were created, we believe, because investors – enthusiastic about prospective earnings growth given the benefits of tax reform and a strong U.S. economy – weren’t interested in playing defense. Most folks don’t go looking for canned soup when the forecast is for warm, sunny weather. As you can see, the new additions to the portfolio are generally more defensive in nature than what we sold. 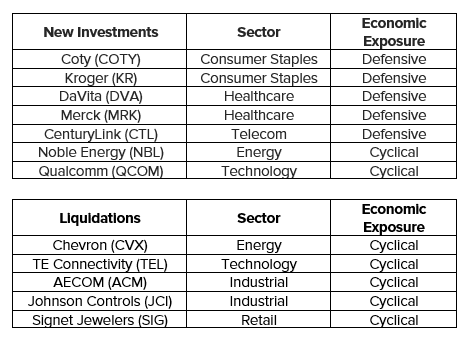 We didn’t make this shift because we are forecasting a recession, but because we believed that, at the prices we paid, these particular investments offered superior ratios of reward versus risk in what may be a late cycle economic environment. More recently, defensive stocks that were on sale have appreciated while more economically sensitive stocks saw price reductions. The perceived outlook for those businesses with greater economic sensitivity had grown cloudy as worries about slowing global growth took root in investors’ minds. Fears of contagion from Turkish, Argentinian and Venezuelan instability are a continuing concern. The implementation of tariffs, the souring of US trade relationships with global partners and the strengthening of the US dollar are exacerbating global growth anxieties. This was particularly the case in several emerging markets (including China, Russia, Turkey, Brazil, Argentina and Venezuela) that experienced “bear market” price declines of 20% or more. These macroeconomic concerns created a stiff headwind to the results of our energy and materials holdings in the third quarter. It shouldn’t be a surprise that, as contrarian value investors, we have been interested in energy and materials companies. We are most attracted to companies where we see a large decoupling between stock price performance and long-term fundamentals. We believe this is the case for our investments in these sectors and we see opportunities despite frustrating recent returns. Financial results and cash flow for companies in these sectors are heavily influenced by commodity prices. Yet, while commodity prices have been rising, many of these stocks continue to underperform. 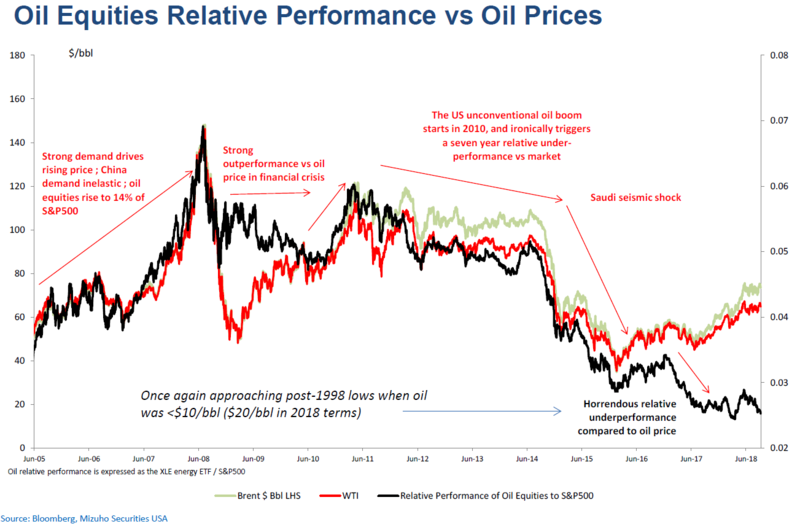 This disconnect between commodity prices and the stock prices of commodity producers has been a headwind to our recent investment results, however, we believe the underperformance has created opportunity. We believe there are several factors driving the disconnect. At the company level, after being burned badly last year, investors fear that future earnings power and returns will be structurally lower with a lack of capital discipline by management teams. They worry, in other words, that as commodity prices rise, there will be a rush of investment to increase production and service capacity. Layer on uncertainty about OPEC policy and a futures curve that is in “backwardation” (i.e. current prices higher than future prices), and it is easy to understand many investors’ current lack of enthusiasm. However, as we examine the facts and company behavior more closely, we see long-term fundamentals skewed in our favor. Oil demand continues to grow strongly, outpacing normal annual growth of a million barrels per day. On the supply side, capital investments industry-wide fell sharply from 2014-2017. While spending will increase slightly in 2018, it is primarily concentrated in North America, whereas spending outside US shale, OPEC and Russia, which collectively account for half of global supply, is down an astonishing 50% from 2014 levels. Given the relatively long lead time of major energy developments, the impact of recent underinvestment will become increasingly clear in coming years. Additionally, with US shale (10% of global supply) showing signs of growing pains and OPEC spare capacity on pace to fall below 2% of global demand, supply growth is likely to be below normal the next 3-5 years. The tradeoffs between short-term macro concerns and significant long-term underinvestment is also true for other commodities, such as copper. Importantly, our investments are not predicated on forecasting a specific commodity price, but rather are driven by company-specific factors including self-help initiatives, valuation and risk-reward ratios. The market analysis above helps us develop confidence in a range for commodity prices and assess the risk of over- or under-shooting that range. We believe long-term, normal prices are approximately $60-$70 for oil, $2.75 to $3.25 for natural gas and $3.00 for copper. As of September 30, 2018, roughly 18% of the net assets of the Poplar Forest Partners Fund was invested in five energy and two materials companies. We are excited about these investments and you can read more about them in the appendix at the end of this letter. While the recent results of our investments in energy and materials companies have been disappointing, we continue to have high conviction in these investments. When we see the type of disconnects between fundamentals and stocks prices as exemplified on above, we get excited. That said, we take time to understand the balance sheet and cash flow dynamics of each of the businesses in question as we want to feel confident that we won’t be penalized by an extended value recognition process. While I may have opened this letter by talking about $10 per pound Prime NY strip steaks, when shopping for stocks, we are looking for something that won’t spoil in a week or two. We are interested in companies that share the characteristics of fine wine – businesses that improve with age. Like a climate-controlled wine cellar, having patient client partners is critical to our ability to invest for the long term. Many of you have been with us for many years and we appreciate your support. We are also heartened by additional investments on behalf of new and existing institutional client partners who believe that value investing is due for a renaissance. To our new clients, I say: “Welcome aboard!” And to all our clients, thank you for your support of the Poplar Forest team. Baker Hughes (ticker: BHGE), the second largest oilfield services company, is in the midst of integrating with GE’s oil and gas business. It is undertaking a meaningful effort to streamline operations and realize synergies with the potential to double operating margins, earnings and cash flow over the next few years. A low debt level is also allowing it to repurchase shares at what we believe are attractive prices. Despite this, Baker Hughes remains out of favor and trades at a discount to both peers and its own history, in part due to investor concern over an eventual GE exit. Devon Energy (ticker: DVN) is a well-capitalized, North America focused E&P with key oil positions in the Permian (Delaware Basin) and Anadarko Basin (STACK). 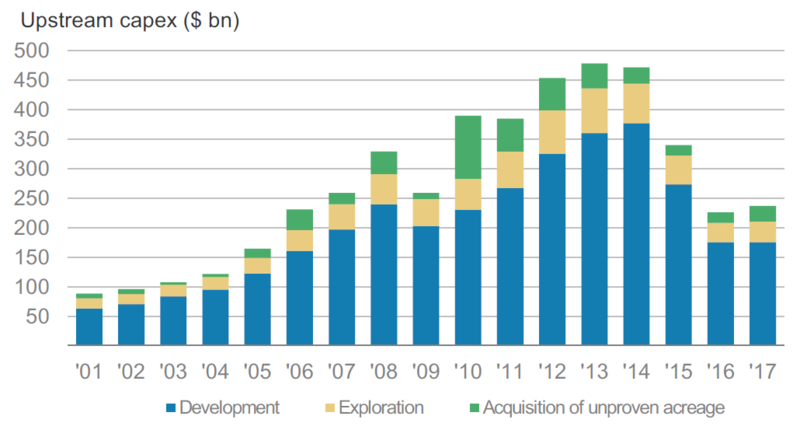 It has a differentiated asset base with a multi-decade runway of low cost, high return drilling locations. Devon is also leading the industry with strong capital discipline, spending within cash flow and returning capital to shareholders. In addition to forecasted double-digit operating cash flow growth through 2020, Devon is executing one of the industry’s largest share repurchase programs. Noble Energy (ticker: NBL) is a large cap E&P with a diversified asset base across US shale (Permian, DJ Basin, Eagle Ford) and international offshore markets. Recent concerns over pipeline constraints in the Permian and potential ballot measures in Colorado have created a compelling opportunity. Double digit production growth in the US and the start-up of its high value Leviathan project in Israel are forecast to double operating cash flow by 2020. At current prices, we believe we get Leviathan’s approximate $2 per share of cash flow for “free.” In our view, its investment grade balance sheet, dividend and share buybacks mitigate downside risk. Weatherford International (ticker: WFT) is an oilfield services company mired in a lot of investor debate. While the stock is trading like there is going concern risk, we see a company in the early innings of a promising turnaround at the bottom of a new upcycle. The turnaround is being led by a highly respected new CEO, Mark McCollum, who has a strong track record as the former CFO of Halliburton. Management is targeting $1 billion of recurring savings (current market cap is $3 billion) and cutting leverage metrics in half. While still early yet, management has so far shown operational improvement, has advanced non-core asset sales and has pushed out near-term debt maturities. Despite investors remaining highly skeptical because of its shaky past and high debt load, we believe risk-reward is very much in our favor. Freeport-McMoRan (ticker: FCX) is the largest copper miner in the world with assets across the US, South America and Indonesia (Grasberg mine). The weakness in the stock this year has been driven by concerns over Grasberg, and most recently, China. With Grasberg moving towards resolution and copper demand and inventory levels favorable, Chinese currency weakness and trade war fears have hurt investor sentiment. Long-term, significant underinvestment in new mine supply and 5- to 10-year development times has increased the likelihood of future supply shortfalls. With the stock reflecting below normal copper prices, we believe Freeport is undervalued. Reliance Steel (ticker: RS) is the largest metals service company in North America. It operates in a highly fragmented market with 2x to 3x the market share of its closest competitor. We view the company as the Berkshire Hathaway of the steel industry – it generates strong returns, allocates capital well and manages its business to take advantage of M&A opportunities in both good and bad market environments. In addition to steel price volatility, recent tariff and China concerns have dampened enthusiasm. However, we believe that at 10x 2019 consensus estimated earnings, Reliance is a well run company offering above average return prospects while trading at a deep discount to the market.